Deutsch: Die „Saint Patrick's Flag“, die dritte Komponente des Union Jack. Sie repräsentiert Irland. 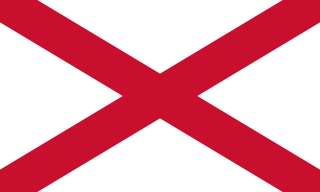 English: This is "Saint Patrick's saltire", the third component of the Union Flag. It represents Ireland and is called "Saint Patrick's cross/saltire", though whether this was originally an authentic symbol of Saint Patrick is historically quite doubtful. Ĉi tiu verko estis liberigita kiel publika havaĵo de ties aŭtoro, Hoshie. Tio aplikatas tutmonde. Hoshie donas al iu ajn la rajton uzi ĉi tiun verkon por iu ajn uzo, sen kondiĉoj, krom se tiuj kondiĉoj deviĝas per leĝo. 23:28, 9 jan. 2010 1 000 × 600 (549 bajtoj) Transparent 6lue Recoding, correcting proportions of bars, correcting colour to Pantone 186 C and changing ratio to 3:5. 05:01, 27 mar. 2006 715 × 436 (2 KB) Hoshie The St. Partick's Saltire has been redone by taking Image:Flag of Jersey.svg and deleting the arms. The red color has been changed to RGB 255-0-0.